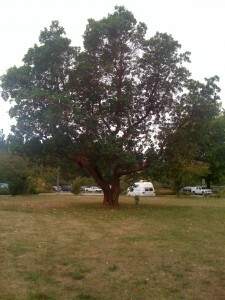 At the north west corner of Agronomy Road and Main Mall stands a grand old arbutus tree. It’s an impressive example. There are few such trees found at UBC these days -more were likely here in the past. I first met arbutus trees on summer visits south from my childhood home on BC’s north coast. For those more acquainted with temperate rainforest conifers the arbutus tree is a surprising plant -peeling paper-thin bark, twisting smooth branches, and leaves all winter when other broad-leaf trees drop theirs. This entry was posted in notable. Bookmark the permalink.